Nicco Montano began the year as the first-ever UFC women’s flyweight champion. Unfortunately, after a string of injuries and health issues, she was stripped of that title, and will now watch on as Valentina Shevchenko and Joanna Jedrzejczyk battle for the vacant throne at UFC 231 this Saturday in Toronto. On Monday, which is recognized as Nicco Montano Day by the Navajo Nation, Montano reflected on this turbulent year. “A year ago I accomplished the impossible, ran up against the “tuffest” opponents and fought my way to earn myself, my team, and my people a platform to share our voice and share our values. It’s been a rough year for me but one thing I know for sure about myself is I don’t let other people’s opinions interfere with how I see myself. I am a strong, open minded, caring person who will continue to see new goals through. My childhood on the Navajo Reservation has brought many hardships and plenty of chances to learn how to overcome them. I deliberately go back to remind myself just how strong and resilient we as a tribe are. I want to thank the Navajo Nation for recognizing the amount of courage one has to go through when living their life in the public eye of skepticism. There are plenty of people who think this road is an easy one, but I know the Navajo Nation knows the true definition of struggle yet they still recognize today as my day.” – Nicco Montano on Instagram. 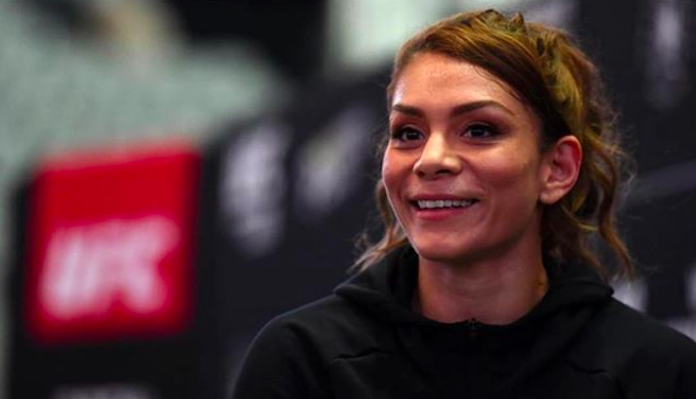 Nicco Montano has not fought since December of 2017, when she defeated Roxanne Modafferi to capture the UFC flyweight belt. She is currently 4-2 overall, and remains a key player in the growing women’s flyweight division.